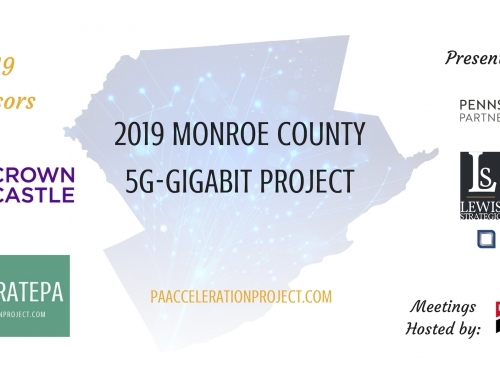 MARSHALLS CREEK — AcceleratePA, the same coalition behind the Monroe Gigabit Project that helped bring higher-speed internet to the Poconos in 2017, has set its sights on a new objective: preparing the region for the imminent rollout of fifth-generation cellular data service. Fifth-generation or 5G wireless technology represents the latest standard of high-performance cellular communications systems. Telecommunications providers worldwide, some already in the first stages of deployment, are racing to bring more advanced hardware and accompanying service improvements to a growing market of wireless customers. On Tuesday, a group of local and regional stakeholders met for an AcceleratePA public launch event in East Stroudsburg University’s Innovation Center at 562 Independence Road. There, Kelly Lewis, a former Monroe County state representative and current president of technology procurement firm Lewis Strategic, introduced Rajamani along with spokeswoman Ashley Henry Shook of the Pennsylvania Partnership for 5G and a panel of other industry leaders. As Shook explained, some advantages of 5G networks will be noticeable to even the most basic users of wireless services. AcceleratePA’s new campaign aims to help public and private sector authorities lay the procedural and infrastructural groundwork for the impending 5G rollouts. Much of the conversation Tuesday centered on the use of small cell networks, which are systems of low-powered cellular radios, to supplement weak spots in existing coverage areas serviced by high-powered towers. “You expect that the phone works from when you leave your house to your garage, you’re driving down the highway, out on the street to get coffee in the morning and into your building,” said Rajamani. “You expect that coverage, and, frankly, with wireless providers, that is their charge: to provide ubiquitous coverage. Part of the preparation for 5G deployment entails updating some of Pennsylvania’s laws governing telecommunications, many of which were drafted when wireless cellular technology was in its infancy or earlier. Local ordinances relating to utility regulations can vary significantly from one municipality to another, further complicating the legal process. For those concerns, the Pennsylvania Partnership for 5G has advocated for a statewide process for small cell applications, said Shook. The Partnership, which currently has 31 members including Facebook and the Pennsylvania Fire and Emergency Services Institute, has urged lawmakers to pass legislation that would establish a single set of rules for all municipalities. Earlier during the event, Smithfield Township Supervisor Robert Lovenheim, speaking from the audience, asked Rajamani what the industry was doing to help educate local governments on rollout proceedings. He also questioned whether the proposed legislation might burden local authorities with an overwhelming volume of paperwork. “We’re not opposed to this, but what happens is it becomes what we call unfunded legislation,” he said. “In other words, all of a sudden we’re inundated with all of this. We can’t handle it. We have a small staff. We don’t know what to do. Rajamani responded, saying that industry leaders are willing to work with local governments. She also contended that the proposed statewide requirements would streamline the approval process in many ways, making it easier to bring needed services to underserved areas. AcceleratePA’s next meeting is scheduled for Feb. 27.